The historical center of Santiago has great monuments that reflect its richness and the settlement of important people with great influence and power. The main axis is around the Cathedral, a building that was begun in 1075 over the remains that Almanzor left and finished in 1128, with sculptures by Mateo. The architectural complex that is formed by the Cathedal with its eclectic facades, the Plaza de Obradoiro with the buildings of the ancient hospital for pilgrims, the university, the archiepiscopal palace, the city hall and the Quintana square is considered to be one of the most beautiful complexes in the world. For me, this is one of the ten places that one must visit in Spain. 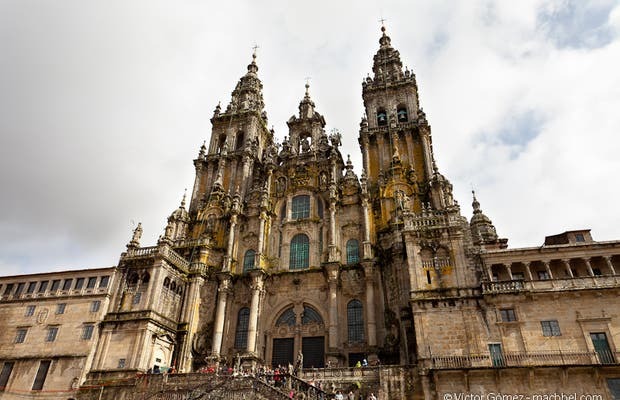 What it transmits is magnificent, from the moment you see it from the Obradoiro square until you enter it, you follow the tradition, hug the Saint, go down to see his remains and visit the catedral. I can’t say much more about the cathedral in Santiago de Compostela. It is one of the most symbolic monuments in Christianism and of European culture. When you go inside you can feel the silence, the soul of millenial culture in all of Europe, that during centuries has grown with the influence of pilgrims and citizens that visit it. The ceremonies inside have a special impact on the visitor, silent and with a rigorous order. Then you go to the holy sepulchre to hug the Saint and appreciate the works of art and architecture in the cathedral and museum. Specifically thought for peregrines, and though I was not one of them I had a wonderful experience. There's so much history and art to see, food is incredible and also very cheap. I highly recommend to pick a free tour to show you the most unknown places which will surely amaze you! The Cathedral of Santiago de Compostela invites us to contemplate life. It houses almost a thousand years of history and its beautiful architecture is just the beginning of a journey through the history of man itself. Awesome medieval town. The cathedral is huge and really old (XIIth century) The town has many cool shops and cafes. The nightlife is amazing. There are lots of hostels and hotels, so don't be worried of finding where to stay unless you go in summer (high season).